Hell hath no fury like a woman scorned, or in Tito Ortiz’s (Pictured) case, like a Hall of Fame fighter who ended his career with a loss to a man who was taking Testosterone Replacement Therapy. 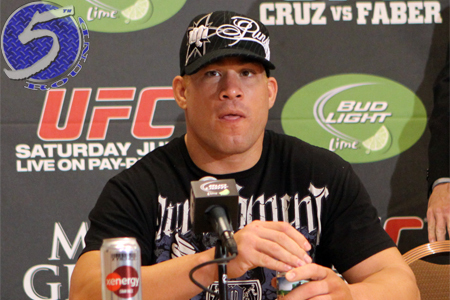 Ortiz completed his decorated mixed martial arts run by dropping a unanimous decision to Forrest Griffin at UFC 148. Little did “The Huntington Beach Bad Boy” know at the time, Griffin had been medically prescribed TRT. While Ortiz remained mum last week when news broke regarding Griffin’s use of the controversial treatment, the 37-year-old unloaded Monday while appearing as a guest on AXStv’s Inside MMA. “This sport’s gone so far in such a short amount of time. I hope this doesn’t become an epidemic,” Ortiz expressed. “What type of message are we trying to send to the youths that are watching our sport? This is the same thing we’ve been trying to stop from happening. All of a sudden, in the last six months, it’s legal to do? It’s clear Ortiz feels cheated he wasn’t able to conclude his career against an opponent who wasn’t taking a performance-enhancing substance, even if TRT is perfectly legal with a doctor’s note. The former light heavyweight champ believes the advantages an athlete on TRT gets physically and mentally are immense. For what it’s worth, if anything, it was reported Griffin’s testosterone levels were within normal ranges in pre-fight tests and the post-fight exam conducted the morning after their tango.